Hola fam! This week marks my 4th transfer here in the Mankato, and it's off to a wonderful start. Exciting news from this week... Tengo un hijo!! 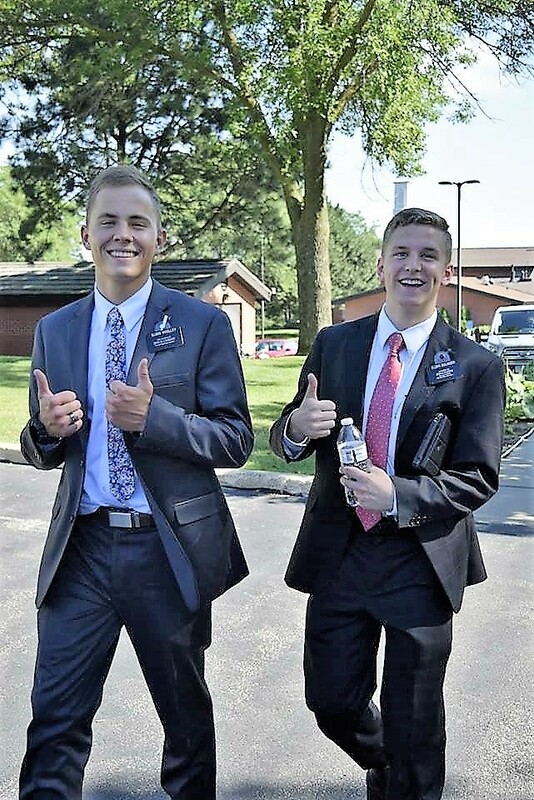 On Wednesday we drove up to the cities and I picked up my new trainee, Elder Woolley! He is a great missionary already and from Riverton, Utah. Surprisingly, my first companion from Utah so far on my mission! Oh, and he is English speaking so I am "zebra" training. It's been a blast! For about a week now, the Vikings have been doing their summer football training camp at MSU. They are here for another week and a half or so, so we have lots of time chunked out to roam campus next week! This is the last year they will be here too, they've been doing it in Mankato for 52 years, but next year will be moving it to the cities in their new practice facility to be built. 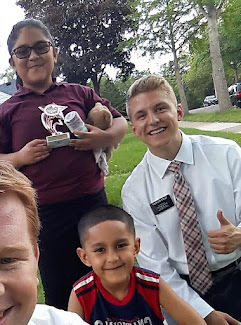 We went there on Saturday and had some really good conversations about the Book of Mormon and what we do as missionaries for people. We talked with about 12 or so people and it was pretty successful! We've also had some solid experiences taking Elder Woolley out tracting haha. A highlight from this week: We felt inspired to go to a specific street and tract an apartment building. The last door we knocked on, we found Stefanie! We showed her a video of the plan of salvation and bore testimony to her of the peace it brings us. She has been to our church in the past for weddings and funerals but this really seemed to spark her interest! So, we got her number and hope to meet with her next week. We found another new potential investigator from a service project we did on Friday. One of our investigator’s friends works with homeless people and helps them find affordable apartments and furniture to have a place to live. Well, long story short, she called us and we got to help move his furniture from the salvation army to his new apartment! His name is Lym and he's from Africa and is a super humble guy. We talked to him about his experience with Christian churches in Africa and how we are also Christians and help people grow closer to Christ. He said he would be open to visits! Another awesome contact from this week. Yesterday we had a pretty sweet miracle. After dinner, we were heading out for some stop-bys before our appointment with an investigator. We walk out the door of the apartment complex and I reach down to grab las llaves (the keys) and.. No keys! Dang! We're locked out. So now we can't get back in the apartment or use the car to get to our appointment haha. So, we had to sacrifice and travel how they do down in South America, the old fashioned way - on foot! We planned a route to stop by some people on the way during our 50-minute trek and had some pretty good contacts along the way actually! Then we had a powerful lesson with Pam, and speaking of purple she is absolutely obsessed with it! Literally everything she owns is purple. Purple house, purple car, purple chairs, purple carpet, and of course, purple hair! Lol. She's super awesome, though, and really receptive. We taught her more about the restoration of the gospel through the prophet Joseph Smith and invited her to be baptized! She unfortunately wouldn't commit to a date, but committed to pray for an answer from God. We're going to continue working with her to help her realize she already has a testimony of the gospel, she just needs to connect the dots!